I am a competent second alto* and sing in a choral society. This term we were performing Mendelssohn’s Elijah and in dull moments during rehearsals, while the conductor was bashing the sopranos into shape, I was reading the introduction to the score, which provided background information about the history of the oratorio, including a chunk about its translation. The relationship and the correspondence between Mendelssohn and his English translator William Bartholemew is a thing of beauty, mutual esteem, respect and recognition of each other’s fabulous talents. When their works are going to be sung in translation, composers need good musically-minded translators. I once sang in a performance of Dvorak’s The Spectre’s Bride, where the English was so dreadful (“ho my darling look at me, jump into the cemetery”) that we sang it in incomprehensible Czech instead. Mendelssohn and his performing choirs over the decades since were better served and he and Bartholemew seem to have worked as a courteous and mutually admiring team, respecting each other’s advice. It was Bartholemew the translator who suggested adding an overture, which Mendelssohn did, and when Bartholemew pointed out that had Mr Mendelssohn noticed that the aria “oh rest in the Lord” began with the same tune as the Scottish folk song Robin Gray, Mendelssohn immediately decided to ditch it altogether, until Bartholemew suggested changing one of the intervals instead: “If you omit it, and especially upon such a reason as my hint may have afforded, I shall be very much pained”. 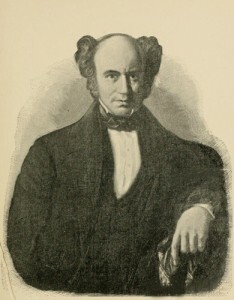 For his part, Mendelssohn went through Bartholemew’s translation in great detail, consulting backwards and forwards on emphasis and slurring and fitting the notes to the new English text, plus a few authorial objections: “I like all the passages of the translation you send me with but two exceptions. In No. 30, ‘that Thou would’st please destroy me’ sounds so odd to me—is it scriptural? If it is, I have no objection, but if not, pray substitute something else”. The other one he objects to is the addition of “water thy couch”, on which I have to say I agree with him. What was Bartholemew thinking? Oh it is a lovely author/translator relationship. Much of their correspondence can be found in The History of Mendelssohn’s Oratorio “Elijah” by Frederick George Edwards on Project Gutenberg. Chapter II “The English Translation” includes a picture of William Bartholemew, “chemist, violin player, and excellent flower painter” and man with impressive hair. This first letter quoted shows that for all the esteem in which he was held by his client, some of the sufferings of translators today had their parallels in 1846. Hackney, London, June 23, 1846. “My dear Sir,—I have at last, after toiling day and night, got through the first portion of your noble oratorio. I wish I could render words more worthy of such music. My endeavour has been to keep them as scriptural as possible; and in order that you may be able to judge how far I have succeeded, do me the favour to refer to the verses notified in an English version of the Bible. When the second part, or the parts of that, as they are completed, are sent, I hope we shall have the words in the score written in letters which are readable to us. I know not how so bad a scribe as he who penned the libretto could have been found; words, nay even sentences were omitted, and words changed: leben was written for beten, and there were no references to where the verses might be seen in ‘The Book.’ All these caused me much perplexity, trouble, and, what is worse than all, loss of time. These, too, enhanced by my journeys to Hobart Place, and the necessity of copying by my own hand all the vocal portion of the score for the engravers, and those parts which you will receive through the medium of Mr. Buxton for your perusal and decision, have rendered my toil, although a labour of love, incessant. The choral portions will this day be in the hands of the engravers; and I trust you will send by every packet each of the pieces yet forthcoming—one at a time(52)—never mind how short, for the time is short—and I want all the time to enable me to do it as well as I can. And the choralists want all the time to rehearse it as often as they can, for the more often it is rehearsed the better. Poor Mr Bartholemew, he’s got the lot. Illegible source text, source text failing to cite references to enable the translator to track down quotes, requesting part delivery due to being squashed between the schedule of the composer and the schedule of the performers, acute time pressure and the nineteenth-century equivalent of having to liaise with the people doing the DTP. And from the later letters, it is clear that Mendelssohn would not stop tinkering with the thing and kept sending him updated versions of the source text. William Bartholemew, we salute you.